The SMA Office and SMA Alumni Club organised a series of seminars and career dialogue sessions in 2009 to enhance the job search prospects and career management skills of SMA students. Through interviews and recruitment talks, the office hoped to bridge the student population with the major industry players and smoothen the transition between academic and professional lives of the students. 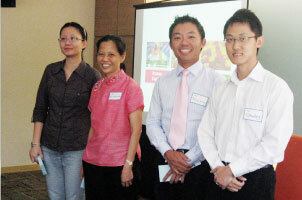 The Education Committee of the SMA Alumni Club organised a career seminar on 22 August 2009 at the Shaw Foundation Alumni House. This event saw a turnout of 50 participants comprising SMA alumni and students. In a lively discussion, Dr Kelvin Wong, Head of the A*STAR Graduate Academy, spoke on the diverse research programmes and projects undertaken by the organisation. He also provided insights on the multiple pathways for PhD graduates to develop and chart their career paths. The Club also invited Mr Sonny Yuen, Managing Director of JonDavidson Pte Ltd, to explain the headhunting process in general and how to improve the chances of being headhunted. During the seminar, he also shared with the audience on the importance of effective networking as a way of establishing one's profile and tips on writing a good resume. In the last segment of the career seminar, the audience was able to garner advice from Mr Vinay Kumar of Standard Chartered and Mr Mayank Gupt of Accenture on embarking a career in the banking industry and business consultancy. On 12 December 2009, the graduating batch of Dual Masters students from the 2008/2009 intake had the prime opportunity to interact with representatives from Applied Materials South East Asia. Besides learning more about the company's worldwide operations, the students got to speak with the President, Mr Russell Tham and his team of engineers to explore the job openings and discover the many advancement opportunities within the company. This event attracted close to 30 students.